A day before parading down a Bangkok catwalk to see who would win the crown, 18 contestants in the Miss Thailand Chinese Cosmos Pageant spent a day under the sun and the lenses of media photographers in Pattaya for the contests swimsuit competition. The young, fair-skinned Chinese-Thai women competing at the Royal Cliff Beach Resort’s pool were vying for a diamond crown and cash prizes of 500,000 baht, as well as a chance to represent Thailand at the Miss Chinese Cosmos Pageant in China. Miss Feng Ling Song, a 21-year-old Shanghai University student, poses for photos during last week’s Miss Thailand Chinese Cosmos Pageant visit to Pattaya. The contestants were in town the day before final judging in Bangkok. Miss Perfect Body Nutshada Kanjanapaiharn struts her stuff. Muthita Santipati, a 23-year-old graduate from Rangsit University, was named first runner-up, winning prizes worth 300,000 baht. Miss Muthita also won Miss Photogenic and Miss Personality, earning an additional 300,000 baht worth of prizes. 20-year-old Rangsit University student Ratanporn Klinkularbhirun finished 2nd Runner up, winning prizes worth 200,000 baht. 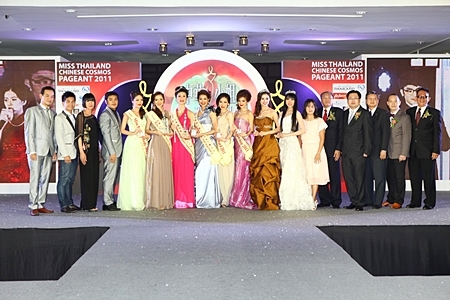 Other winners included Premwadee Amrapornpisut, Miss Tourism Award with prizes worth 100,000 baht; Nutshada Kanjanapaiharn, Miss Perfect Body with prizes worth 100,000 baht; and Pakinee Lohapansomboon Miss Friendship with prizes worth 100,000 baht. In Pattaya, however, none of the women knew who would be wearing the crown, and so all eagerly showed off their glowing smiles and slender profiles to the overwhelmingly male pool of photographers. Decked out in pastel swimsuits from designer brand Elle, the hopefuls were all seeking a share of the $1.6 million in prizes that would be handed out the next evening. 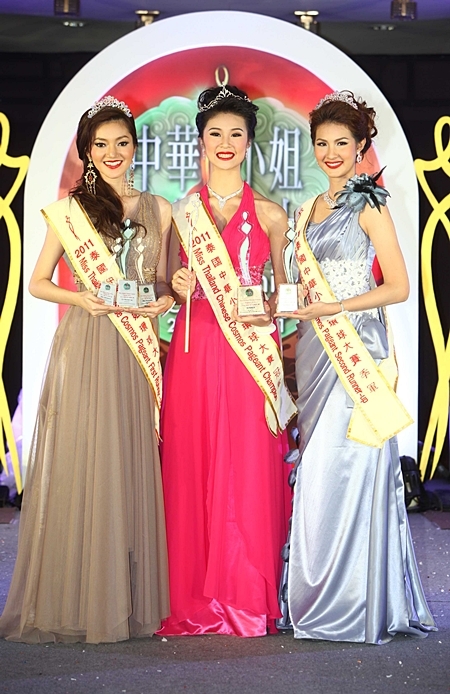 The 3 winners will compete in the Miss Chinese Cosmos South East Asia Pageant 2011 being held in Malaysia from July 28 – August 14. 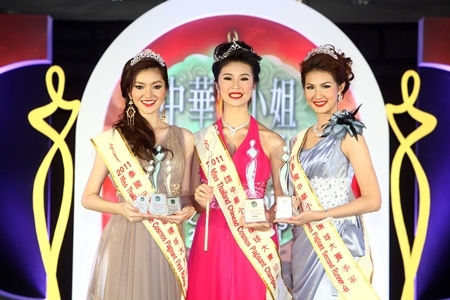 The overall Miss Cosmos pageant finals will take place later this month in Hong Kong. Muthita Santipati was named first runner-up, also winning the Miss Photogenic and Miss Personality titles. Feng Ling Song gives judges the winning pose. Contestants form a chorus line of pulchritude.